After all those years of hard work during law school, the thought of failing the bar exam can cause a lot of stress. It might be the most important written test of your life. However, if you prepare properly, you almost certainly will pass. My friends and colleagues who failed the bar exam all came back and passed it on their second or third try, so this is not a do-or-die situation. What I observed about these folks is that they most always were undone by at least one of three issues: not knowing the subject matter well enough; cracking under pressure on the day of the exam; or not being good at taking standardized tests. These three issues are often interrelated, so you cannot ignore any of them. Here are some tips to give you the best shot of passing the first time. You have spent three years and perhaps over $100,000 getting your law degree. So why get cheap now when you are trying to pass the bar exam? If you can at all afford it, you should take a paid bar exam review class. These classes do several things to enhance your chances of passing the test. First, they impose an effective structure to a preparation process that lasts almost two months, because you have a place to go and learn at the same time every weekday. This structure helps you avoid the big mistake of not knowing the subject matter well enough due to procrastination or overconfidence. Second, these classes teach you tactics for answering exam questions effectively and give you opportunities to take practice exams with feedback afterward so you can correct your mistakes before they count. If you are not a good standardized test taker, this will be invaluable practice to improve your skills. Third, you can connect with other people taking the class and make new friends while realizing you are not alone in your fear of failure. This personal touch, along with the individual and small group tutoring available with many review classes, is just what some people need to build their confidence and avoid a meltdown on test day. Studying with others also makes you more likely to keep at it diligently, much like having a workout partner. 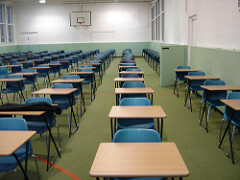 Most bar exam review classes meet in the mornings or evenings for a few hours during weekdays. So, you should be spending another 4-5 hours each weekday studying on your own, with a group and/or a tutor. Taking this approach should give you plenty of time to learn the material and hone your test taking skills without burning you out. (If you must work for a living while you prepare for the exam, try to do so on weekends only, or plan to give up all your free time on weekdays.) During the two weeks before the exam, you can add practice tests and review your weakest subjects on weekends. Of course, you can try to just attend the review classes until the week or two before the test, and then cram for it, but I have seen that approach fail many times. Don’t do it. Preparing too much or too early can be as defeating as not preparing enough or too late. Proper preparation for the bar exam requires a steady effort. I know it is a cliché, but you need to study much like you would train for a marathon – steadily building up your capacity to give your best effort when it counts, without exhausting yourself. I have seen people put in 12-hour days every day for two months and fail the exam because they were burned out by the time test day arrived. I have also seen people not study much and then pull several all-nighters trying to cram for the exam in the last couple of weeks and be equally exhausted on test day. You should get some exercise and a good amount of sleep every day while you prepare for the exam. Develop a rhythm of balanced living and diligent preparation. Also, I recommend taking weekends off from studying until the last couple of weeks. You need to be fresh, alert and healthy for the 2-3 days of the exam, because it is exhausting.